Update 1/2015: This beef stew continues to be a favorite around here! It’s so good I never bother to explore other recipes. I have most recently been making it in the slow-cooker, so I’ve added the slow-cooker instructions below. It is hearty, meaty, and comforting! I like making it for Sunday dinner or for company. It’s delicious with gluten-free cornbread muffins! I will be eating my words and wanting nothing more than the year-round 70-degree San Diego weather. But for now we are soaking up being able to open up the windows all day and going outside with a light jacket on. 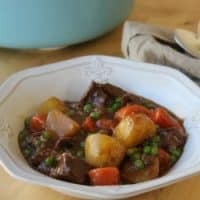 Beef stew is one of my favorite winter comfort foods. 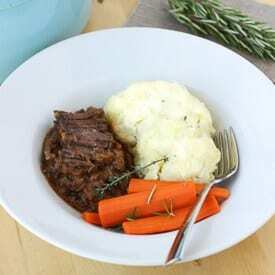 Something about the marbled chuck roast braising with root vegetables in a base of red wine gets me every time; whether that be my favorite pot roast or beef bourguignon. 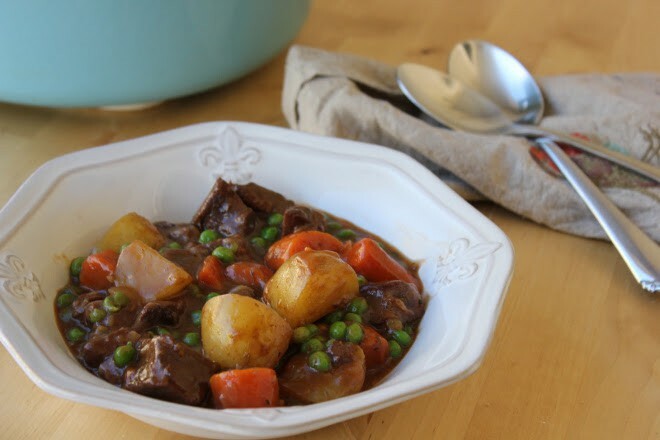 I’ve tried many beef stew recipes and this one comes out on top. So many are lacking that rich meaty flavor I expect from such a stew. We served this with gluten-free corn muffins and a fresh green salad. 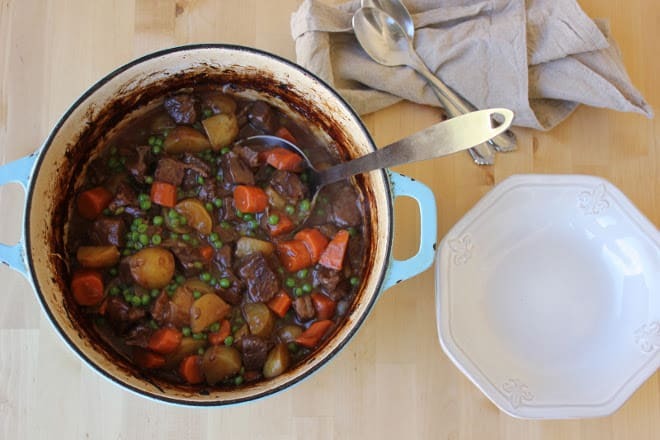 I love how rustic the stew looks and it is great for serving a crowd. Perfect comforting and meaty beef stew. Pat meat dry with paper towels. Do not season. Heat 1 tablespoon olive oil in a Dutch oven over high heat until shimmering. Add half of beef and cook until well browned on all sides, about 8 minutes. Reduce the heat if oil begins to smoke or fond begins to burn. Transfer beef to the slow-cooker. Repeat with remaining beef and 1 tablespoon olive oil, then add to the slow-cooker. Add 2 teaspoons olive oil to the now-empty dutch oven if needed, add the onion and carrots. Cook, scraping bottom of pan to loosen any browned bits, until onion is softened, 3-4 minutes. Add garlic and tomato paste and cook, stirring constantly, until fragrant, about 30 seconds. Add flour and cook, stirring constantly, until no dry flour remains, about 30 seconds. Slowly add the wine, scraping bottom of pan to loosen any browned bits. Increase heat to high and allow wine to simmer until thickened and slightly reduced, about 2 minutes. Stir in the broth, bay leaves, thyme, and salt pork. 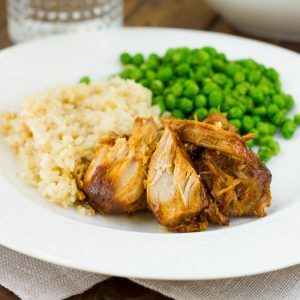 Bring to simmer, then transfer to the slow-cooker. Cook on low for 4-6 hours. 2 hours before eating remove the salt pork and add the potatoes. 20 minutes before eating stir in the peas. Season with salt and pepper and serve. Enjoy! You are welcome to join in my monthly food blogger event THE SOUP KITCHEN, here for entry details and current theme. New theme each month. All bloggers are welcome, hope to see you participate soon. This is a wonderful recipe. Reminds me of a delicious stew my mother used to make! Is there anything I can substitute for the salt pork? Or omit it completely? I’m looking forward to trying this. So far I haven’t found any hing I haven’t enjoyed from your recipes. Thank you! This has become a favorite staple of our family! Thanks! We just toss in bacon instead of salt pork and we don’t remove it as it just sort of melts. can you substitute the wine for Guinness if making for st. pattys day? I’ve never tried that myself so I’m not sure! how many does this recipe serve? How many does this serve? Thank you.